The title of this album doesn’t mean anything unless you’ve come across this three-pianist family before. When you couple that with the composers showcased, who for most people will be unknown, apart perhaps for Pēteris Vasks whose music has recently become increasingly programmed in concerts, you have a CD full of discoveries. Though as a reviewer I had come across these composers before, I hadn’t heard any of their piano music and I must say it is a delight to do so. It only emphasizes how much music there is to discover and the certainty we’ll never hear it all. It is the music of Pēteris Vasks which kicks the record off and the two pieces are true examples of mood music which is immediately appealing, while the playing of father Sergej Osokins’ youngest son Georgijs perfectly matches the delicate shape of the music. He also polishes off the little gem entitled Arietta by Ādulfs Skulte whose apparent fragility is revealed with all its charm by this talented pianist who studied at the Juilliard School in New York as well as The Robert Schumann Hochschule in Dusseldorf. It is the father, Sergejs, who takes over for the next 17 pieces, the first seven by Jānis Zālītis who studied under Jāzeps Vītols, considered the father of Latvian music, while he was teaching at the St. Petersburg Conservatory. Zālītis spent 11 years in St. Petersburg during which time he wrote many of his vocal compositions for solo voice and choir and much else. It can only be imagined how thrilling for a young Latvian composer it must have been to be immersed in a musical world in which Scriabin was active and Stravinsky, Prokofiev and Miaskovsky were flexing their musical muscles, let alone the influences being felt from composers such as Debussy, Ravel, Mahler, Schoenberg and Bartók. Apart from his four-part sonata which is not included here, all of his piano compositions are miniatures and were all written during those eleven years in St. Petersburg (1904-1915). They are true miniatures, none of them lasting as much as two minutes and most a good deal less. From the sheer delicacy of his Album leaf to the energy of his two Mazurkas this composer provides the merest glimpse of what he could have written in terms of piano music had he chosen to compose anything for the instrument of greater significance, leaving us with tantalizing and bittersweet thoughts of what might have been. Jānis Ivanovs (1906-1983) was a composer whose life was divided between living in an independent country from the age of 12 that by the 1930s was under autocratic rule and then at the outset, and, after the end of the Second World War, was incorporated into the Soviet Union in which it remained as the Latvian SSR until 1990. His two sets of preludes are as charming as the music by the previous three composers. The first set was dedicated to his young son; they are simple with a winning innocence about them. The second set is more introspective, nostalgic even, tinged with sadness. Arturs Maskats is from a newer generation of Latvian composers. Both he and Vasks were products of the post-Second World War country that saw itself part of the Soviet Union with all that entailed in the way of restrictions and an insistence on writing music that reflected the new ‘Soviet man’. Of course, Ādulfs Skulte and Jānis Ivanovs were subjected to the same constraints, but what is interesting is that, if one compares the music by all of them with that of Jāzeps Vītols and his pupil Jānis Zālītis none of it seems forced or unnatural. The music here ranges from the early 20th century to 2011 and is linked by a common thread that manifests itself in simplicity, innocence and beauty. Maskats’ Kazbegi: Tsminda-Sameba was inspired by a journey to Georgia during which he visited the Tsminda-Sameba monastery. If the name of this monastery means nothing to you, you will find enlightenment and photos easily enough on internet. Who could not be moved to compose something after visiting somewhere so jaw-droppingly stunning? Maskats’ piece, the longest on the disc, is unsurprisingly atmospheric. The monastery with the breathtaking backdrop of Mount Kazbek in the Caucasus Mountains, sits at 2,500 metres (8,200 feet) above sea level. Maskats brilliantly recreates the feeling of majesty. It is a fitting tribute to a once-in-a-lifetime experience that is calculated to make one wish to visit it too. It falls to the music of the aforementioned ‘father of Latvian music’ Jāzeps Vītols to close this extremely enjoyable disc. Vītols’ music inherits the charm of 19th century salon music, simple in concept but a delight to the ear that the listener will be pleased to hear again and again. 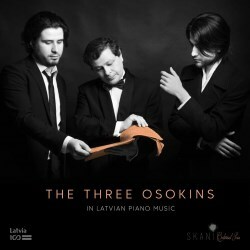 At the end of the disc we can say we have had a good introduction to the piano music of Latvia, with 6 composers represented, and to the artistry of the Osokins, father and sons who do the composers proud and demonstrate a love for their country’s music. If, like me you enjoy being exposed to music off the beaten track, you will find plenty to enjoy here and an encouragement to explore the country’s music further and if so, job done!